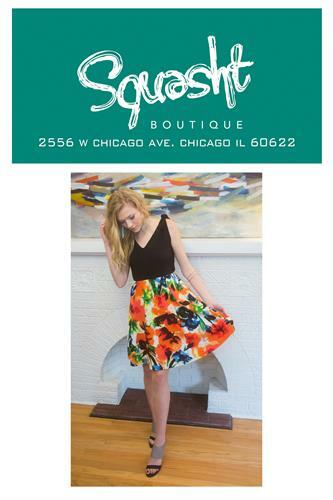 Squasht Boutique is an independent, woman-owned and operated clothing and accessories boutique in Ukranian Village. We produce a seasonal line of women's ready-to-wear clothing as well as headbands and hats. We also carry the work of other independent designers and artists from near and far. We are your one-stop shop for high-quality garments, accessories, jewelry, and gifts, all made by small labels. Handmade Dresses, made right here in Chicago, by us! We are located on the corner of Chicago Avenue and Rockwell, just west of Western. Street parking available.